PMS or Pre menstrual syndrome is a common affliction that affects millions of women prior to their menstrual period. It triggers off reactions that can range from headache and fatigue to depression and weight gain. Let us take a closer look at the signs of PMS and how it manifests in different women. We understand the interplay between hormones and neurochemicals that triggers off PMS symptoms. Is there any medication for PMS that can provide some relief? Why do some women suffer more disruptive symptoms than others? Find out answers to these questions and more. An estimated 40 million women suffer from Premenstrual syndrome. Women in their luteal or latter phase of the monthly cycle are prone to hormonal changes that bring about physical, emotional and psychological reactions. PMS could be a response to declining levels of estrogen and progesterone. Estrogen, the female hormone rises after menstruation peaking around the time of ovulation. Its levels drop just before the onset of menstruation. Since this hormone holds fluid, women suffer fluid retention and bloating prior to menstruation. It also brings about salt retention within the body. Some neurochemicals may be responsible for PMS signs. Certain hormones that regulate the body's fluids and electrolytes (Mineralocorticoids) are also disturbed prior to menstruation. This accounts for the bloated feeling that many women suffer during PMS. Prostaglandins that play a vital role in the luteal phase of the menstrual cycle could also be responsible for some of the symptoms of PMS. Women experience low levels of serotonin during this period and this can trigger off feelings of anger and anxiety. Similarly, decreased levels of endorphins that control pain threshold may also play a significant part in causing PMS signs. Skin symptoms such as acne, oily skin and greasy or dry hair. 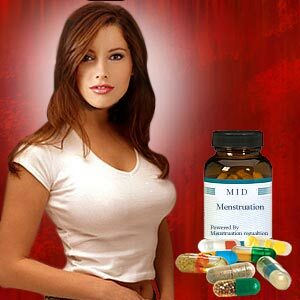 It is noticed that PMS symptoms taper off with menstruation and recur after another 2 - 3 weeks. There are no diagnostic tests for PMS. When these symptoms sync with a woman's menstrual cycle, it is considered a case of PMS. PMS symptoms can worsen during periods of hormonal turbulence such as childbirth, miscarriage or change in contraception. PMS is seen more often in women of the age group of 30 - 45 years. Many PMS sufferers also experience hypoglycemia (low blood sugar). Women may experience some relief from PMS signs by making some changes to their nutrition and lifestyle. Sometimes women are asked to undergo thyroid function tests to rule out hormonal imbalances and medical disorders. Psychological counseling is also resorted to as part of PMS treatment so as to be able to cope better with the changes in mood and energy levels. Premenstrual Dysphoric Disorder (PMDD) involves marked mood changes that resemble major depression. A supportive spouse or social group can help a woman through the vulnerable and difficult period. Multivitamin supplements containing B6, B complex and magnesium are recommended for alleviating irritability, joint aches, depression and fatigue. Regular exercise is known to reduce the PMS symptoms. Exercise can reduce stress as it also affects hormone levels. Exercising regularly for 20 - 30 minutes thrice a week may provide relief. Improved blood circulation and increased natural production of beta- endorphins have been known to provide some relief from PMS symptoms. Aerobics, walking, jogging, swimming and yoga are some of the recommended activities. Decreasing caffeine and alcohol can help curtail irritability and mood swings. Dietary changes such as reducing refined sugar, dairy products and animal fats may be beneficial to relieve symptoms of PMS. Small amounts of complex carbohydrates eaten every three hours is known to keep blood sugar levels at even keel. Supplementing the diet with high calcium food such as yoghurt, skimmed milk and low-fat cheese can be a good idea. It has been noticed that moderate doses of magnesium and Vitamin E may provide relief from PMS. Prozac, a Fluoxetine is prescribed by doctors as PMS medication to reduce symptoms. Though Alprazolam aids in reducing anxiety and depression, it can be addictive. Evening primrose oil is known to provide some benefits to women suffering from PMS symptoms such as breast tenderness. Diuretics are used as medication for PMS symptoms of bloating and fluid buildup. Anti-inflammatory drugs such as Ibuprofen are prescribed to relieve PMS associated pain.